It occurred to me the other day that I want to practice more, but I don’t. I started this blog 9 months ago and haven’t posted to it in 4 months. 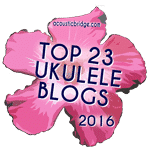 I certainly did not stop playing or enjoying the ukulele. But my focus on it has taken a back seat to laziness, different projects and other distractions. Lately I practice for about 15 minutes 3-4 times per week. While this is sufficient to keep my chops up, I’m not progressing at all. I often think about wanting to practice more, but I don’t. This strikes me as an odd thing about humans. We find ourselves unable to find the discipline to do what we want to do. So I spent some time a couple days ago considering what a more structured practice plan might look like, what would keep it interesting and how to keep myself accountable. Here’s what I came up with. Playing piano, trumpet and then guitar as a kid, the rule of thumb was 30 minutes of practice per day. That still seems reasonable to me. When I was taking lessons, the teacher would give me an assignment – something specific to practice each week. So I’m going to do that with myself. Each weekend I will give myself an assignment for the coming week. After the 30 minutes of structured practice, I get to do something a bit more fun. Not that I don’t enjoy practice, I do. But it’s work. These non-practice activities will support my practice in various ways. The key will be to plan these at least one day in advance. That will keep me from just frittering away the time. Finally, this all sounds well and good, but how to keep myself accountable? The best idea I’ve come up with is to post my practice plans and results at least weekly to this blog. Today was day 1 – I practiced for 30 minutes (just worked on songs I already know as I hadn’t planned anything specific) and then wrote this post (after realizing I’d lost this blog and trying to recover as much as I could). I won’t do this every day, but if I manage 3-4 days per week it will be a huge improvement over what I’ve done for the past 4 months or so. We’ll see how it goes.